In a verdict issued yesterday afternoon at Sacramento Superior Court, a jury found two men guilty of second degree murder on behalf of a Sacramento street gang. 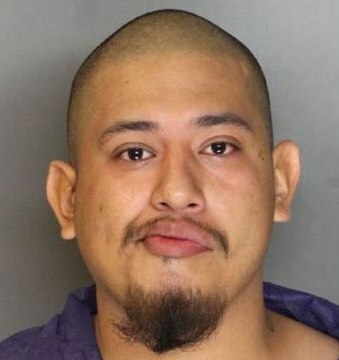 Sebastian Flores Torres (pictured above) and Jose Guadalupe Salazar were convicted for the murder of Shannon Gregg and two counts of assault with a deadly weapon. The jury also found both guily the pair committed the crimes for the benefit of a criminal street gang, the Howe Park Sureños. On March 12, 2014, a juvenile gang member belonging to the same gang as defendants Torres and Salazar got into a verbal altercation with a group of juveniles near the intersection of Bell and Alta Arden. The juvenile gang member fled the scene and told defendants Torres and Salazar about the altercation. That same juvenile along with two other minors and Torres and Salazar drove back to fight and found the group of juveniles now standing in the front yard of a nearby home. As the five gang members began to approach the group, the home owner, Shannon Gregg, came out of the house in an attempt to prevent a physical altercation. The gang members began assaulting the individuals in the front yard. Gregg and an adult friend attempted to help fend off the attack when he, his adult friend, and one of the minors standing in the front yard were stabbed. Gregg died from a stab to the heart. The defendants face a maximum sentence of 26 years and 8 months to life in prison. Sentencing is set for April 28, 2017, at 9:00 a.m. in Department 28 before the Honorable James McFetridge.